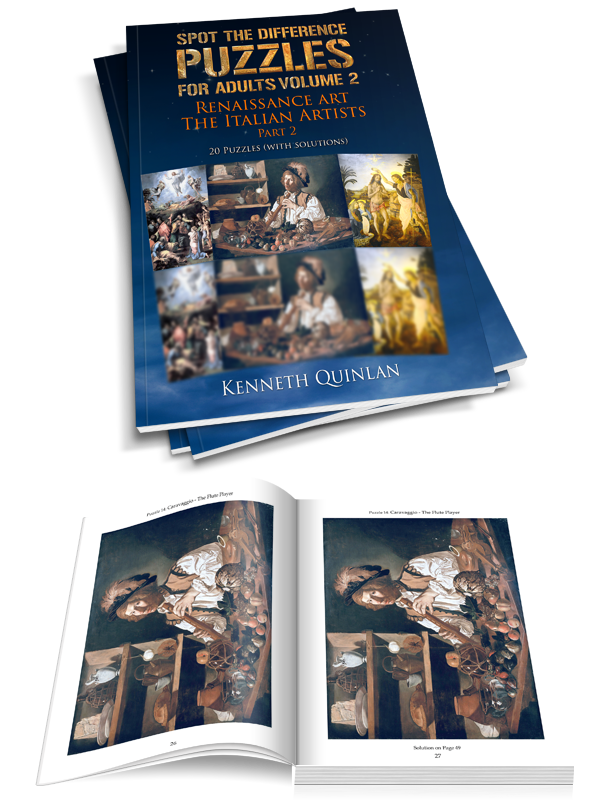 This is the second book in a series of adult spot the difference books by Kenneth Quinlan. 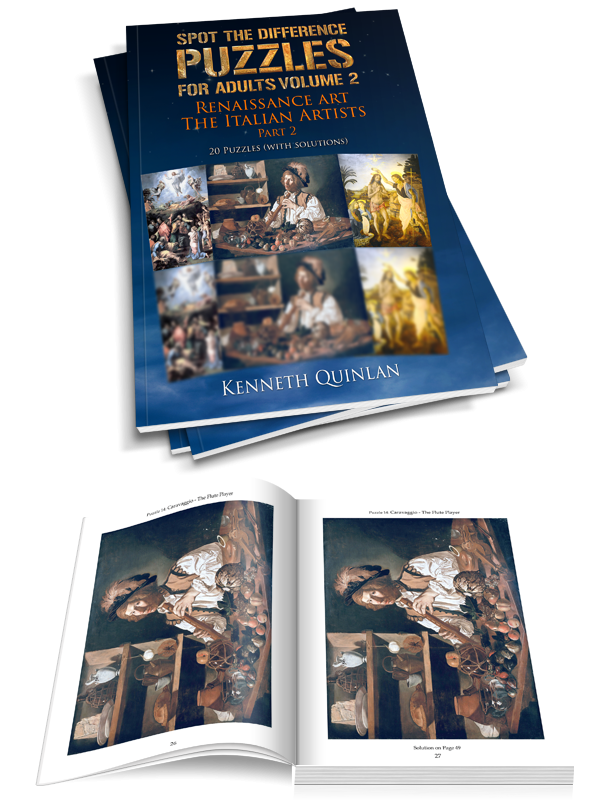 This is the print version of the book, which is also available as a Kindle book and as a downloadable PDF. 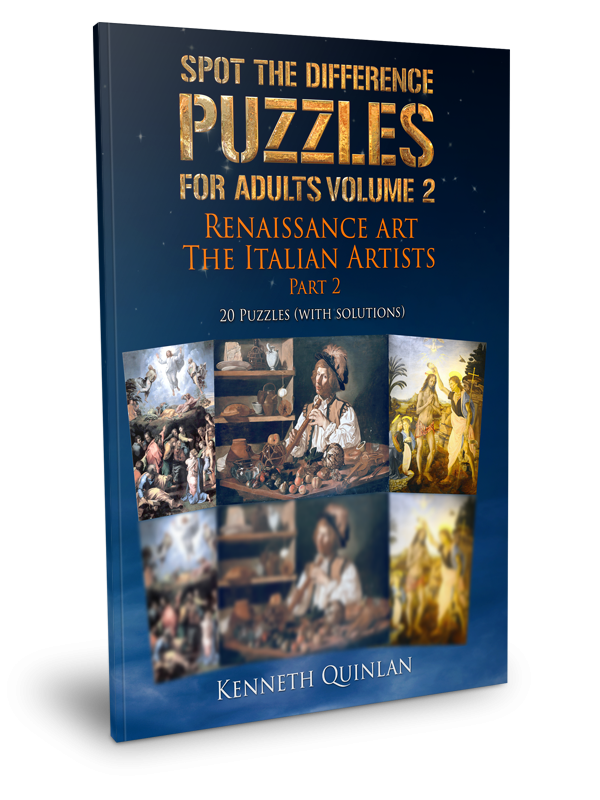 In Spot The Difference Puzzles For Adults – Volume 2, you will find 20 full-color examples of well-known Renaissance art by a number of Italian artists. 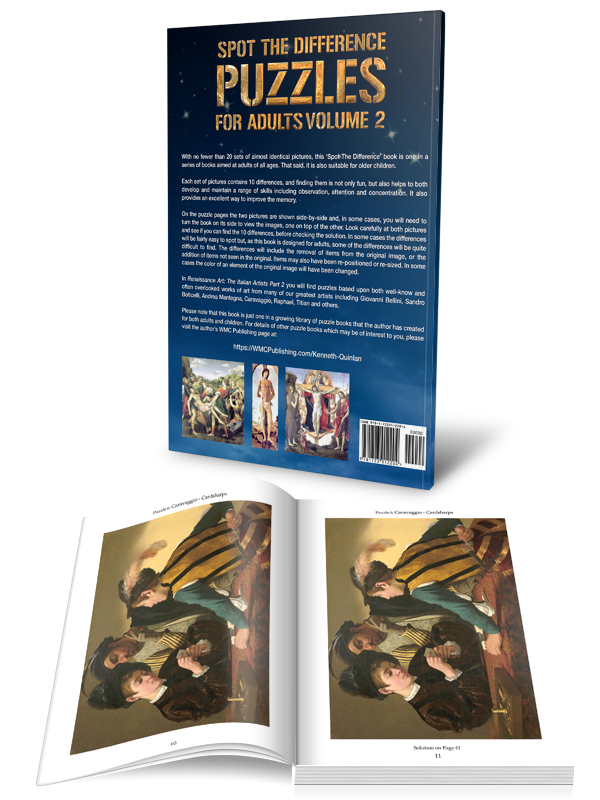 In each case you are presented with the original work, together with a copy with 10 differences. 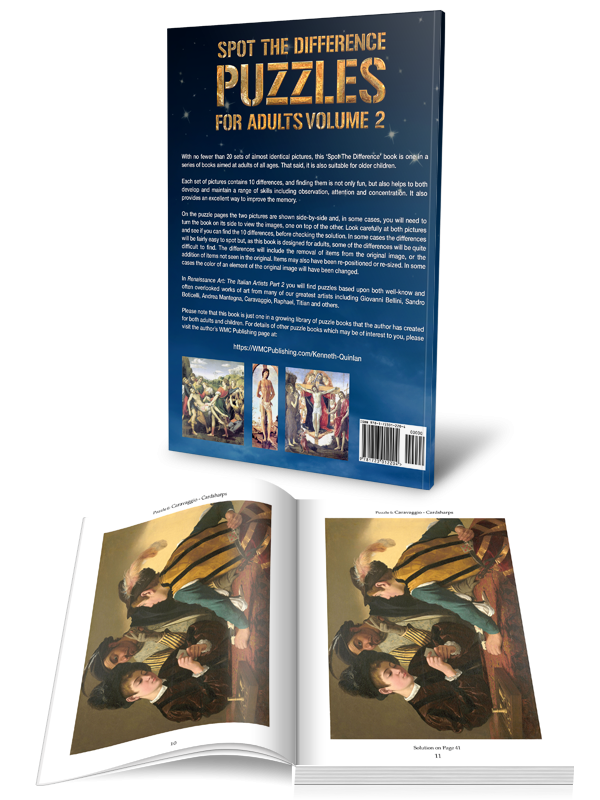 In some cases the differences will be fairly easy to spot but, as this interactive art book is designed for adults, some of the differences will be quite difficult to find. The differences will include the removal of items from the original image, or the addition of items not seen in the original. Items may also have been re-positioned or re-sized. In some cases the color of an element of the original image will have been changed. Improved Memory. Problem solving helps to create new connections within the brain, aiding brain development and speeding up thought processes. Improved Visual-Spatial Reasoning. Often overlooked, the ability to think not in words but in pictures is an important skill, which helps with many everyday activities like driving. Increased IQ. Improvements in memory and reasoning combine to produce a demonstrable increase in IQ. Lowers Stress Levels. 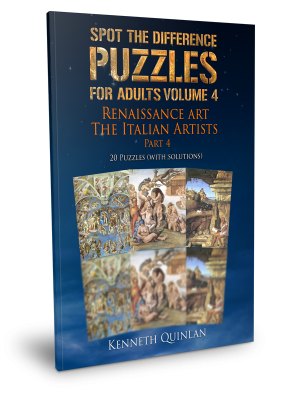 Changes within the brain’s state while engaged in puzzle solving lead to a lowering of stress. Increased Educational Opportunities. 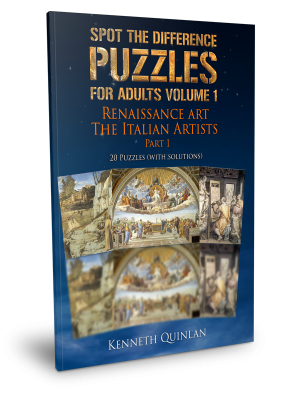 You are never too old to learn and puzzle and general problem solving help to develop skills in areas ranging from research to mathematics and language. Increased productivity. 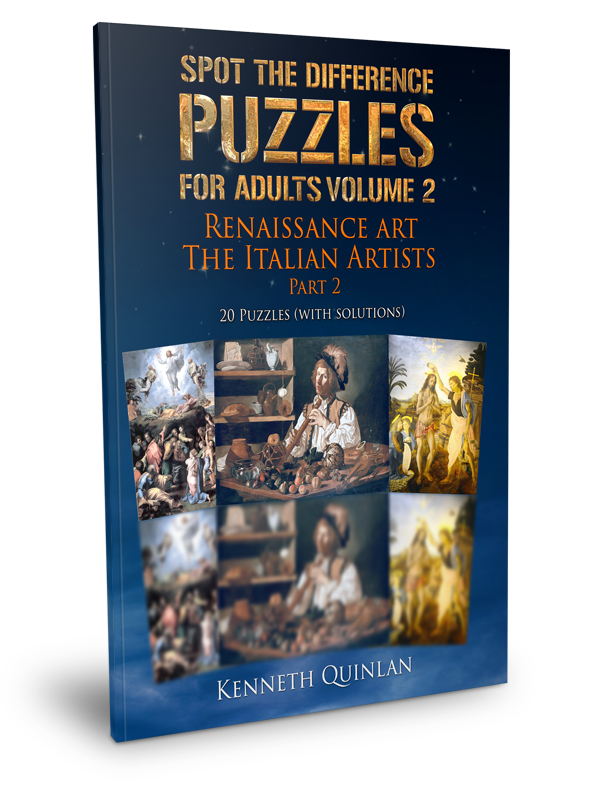 The combination of lower stress levels and mindfulness which accompany puzzle solving spill over into life generally and are often seen in terms of greater productivity. Delay the onset of Demetia and Alzheimer’s. Many of us fear the onset of mental problems as we age and so it is vital that we take steps to help prevent this, or at least to delay its onset. 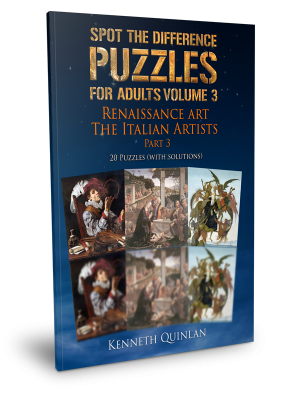 Puzzle solving is an important tool in this respect. 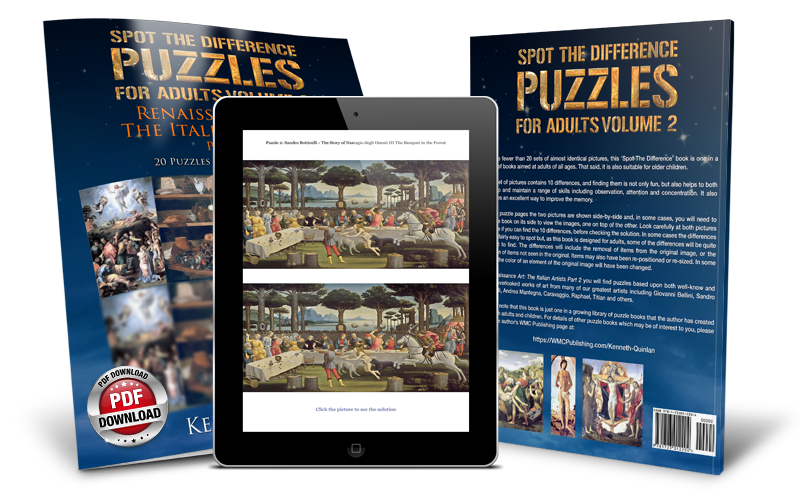 This puzzle book, based upon renaissance paintings, is just one in a growing series of Spot The Difference Puzzles For Adults covering some of the world’s greatest religious paintings and other works of art.